This episode corresponds to the section of Homer’s Odyssey where Odysseus and his men are captured by Polyphemus, the Cyclops. In Homer’s epic, Odysseus lands on the island of the Cyclopes (Sicily) during his journey home from the Trojan War and enters a cave filled with provisions with some of his men. 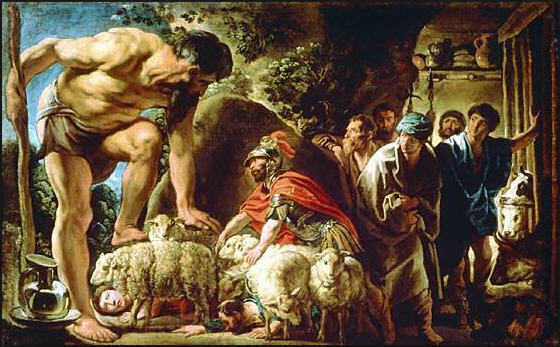 When the giant Polyphemus returns home with his flocks, he blocks the entrance with a great stone and, scoffing at the usual custom of hospitality, eats two of the men. Next morning, the giant kills and eats two more and leaves the cave to graze his sheep. After the giant returns in the evening and kills two more of the men, Odysseus offers Polyphemus some strong and undiluted wine given to him earlier on his journey. Drunk and unwary, the giant asks Odysseus his name, promising him a guest-gift if he answers. Odysseus tells him “Οὖτις”, which means “no one” and Polyphemus promises to eat this “Nobody” last of all. With that, he falls into a drunken sleep. Odysseus had meanwhile hardened a wooden stake in the fire and now drives it into Polyphemus’ eye. When Polyphemus shouts for help from his fellow giants, saying that “Nobody” has hurt him, they think Polyphemus is being afflicted by divine power and recommend prayer as the answer. In the morning, the blind Cyclops lets the sheep out to graze, feeling their backs to ensure that the men are not escaping. However, Odysseus and his men have tied themselves to the undersides of the animals and so get away. As he sails off with his men, Odysseus boastfully reveals his real name, an act of hubris that was to cause problems for him later. Polyphemus prays to his father, Poseidon, for revenge and casts huge rocks towards the ship, which barely escapes. —Ay, says I. A bit off the top. An old plumber named Geraghty. I’m hanging on to his taw now for the past fortnight and I can’t get a penny out of him. The narrator is not a pleasant person. He seems to have an issue with everyone. He is totally self-centered (focused on his I) and, in my humble opinion, kind of a jerk. But then again, we all have our own egos inside and often think things about others which we keep to ourselves. Since Odysseus blinded Polyphemus, the metaphor of blindness appears throughout the chapter. —Some people, says Bloom, can see the mote in others’ eyes but they can’t see the beam in their own. —Raimeis, says the citizen. There’s no-one as blind as the fellow that won’t see, if you know what that means. There is a lot of symbolism tied in to this short quote. On one hand, the narrator is blind to the opinions of others. He is solely concerned with his own opinions. Bloom is blind to the hostile anti-Semitic feelings that the people around him are feeling towards him. The people of Ireland, represented by the citizen, are blinded by their intense desire to establish a national identity. Finally, the mention by the citizen of “no-one” is an allusion to the name that Odysseus used when he fooled the Cyclops. As the episode continues, the environment becomes more and more hostile towards Bloom. This is especially evident through the citizen, who gets so worked up he starts verbally attacking Bloom as he makes his exit from the pub with Martin Cunningham. The citizen follows him out to the street, hurling anti-Semitic insults at Bloom, who responds by naming famous Jews from history, including Jesus, which enrages the citizen even more. —Well, his uncle was a jew, says he. Your God was a jew. Christ was a jew like me. —By Jesus, says he, I’ll brain the bloody jewman for using the holy name. By Jesus, I’ll crucify him so I will. Give us the biscuitbox here. The episode concludes in a similar manner to the corresponding section in the Odyssey. As Bloom is escaping in the carriage (symbolic of Odysseus’ ship), the citizen, who is blinded by rage, throws the biscuit tin (symbolic of the boulder) at Bloom, but misses his mark. Begob he drew his hand and made a swipe and let fly. Mercy of God the sun was in his eyes or he’d have left him for dead. Gob, he near sent it into county Longford. The bloody nag took fright and the old mongrel after the car like bloody hell and all the populace shouting and laughing and the old tinbox clattering along the street. You’re doing awesome work here, Jeff! Thanks Christy! It means a lot to me to hear that from you. Hope you have a great weekend! You’re welcome, Jeff. Thanks and happy weekend to you too! You might like my post on the Dublin Writers museum if you like Joyce. Fantastic blog. Really enjoyed reading this post. Emma. I’ve always thought that Bloom’s short speech about love being the opposite of hate is the most important passage in the whole book. Hi Scott. Interesting. I had glossed over that, but now you have me thinking. How does that tie into Leopold and Molly’s relationship? I’ll keep that in the back of my mind as I read on. Thanks for your thoughtful comments. It’s always great to hear your thoughts on things. Cheers!